In 1947, Lt. Col. Joseph Lamb, the division's former Operations officer (G-3), with the support and encouragement of Maj. Gen. Albert C. Smith and General Jacob L. Devers, began efforts to start an association of veterans of the 14th Armored Division. The process was understandably delayed as the majority of the veterans were busy reintegrating into civilian life, attending college, and starting families. 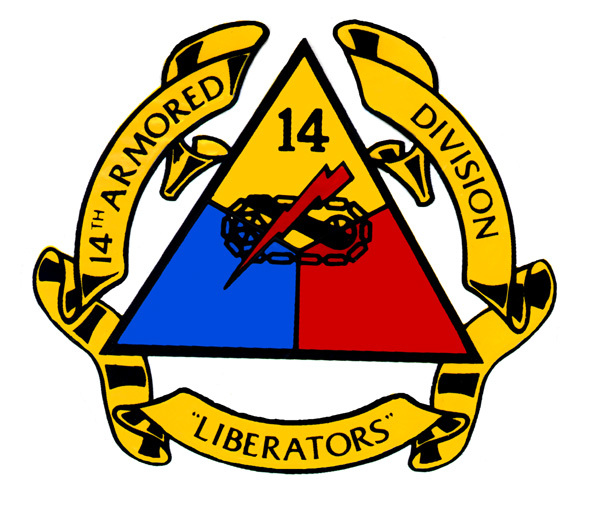 The 14th Armored Division Association was finally formed in 1965. The membership voted to make the Association permanent in July of 1966, and the Association has held reunions in every year since. In 1967 the Association published the first issue of its official newsletter, The Liberator. The Association is recognized by the U.S. Army as the official veterans association of the 14th Armored Division. Membership in the 14th Armored Division Association is open to veterans of the Division, members of their families, and their descendants. Veterans of units attached to the Division in combat are also eligible for membership, as are members of their families, and their descendants. Special memberships may be awarded at the discretion of the Association. The 2016 Reunion will be held in Evansville, IN on Sept 7-11 at the Hampton Inn Airport Address: 5701 US-41, Evansville, IN 47711 Phone:(812) 464-1010. Additional information can be found in the Association newsletter The Liberator. The Association wishes to thank Mr. Eric Perez and Ms. Mariko Lankford of the East Valley Institute of Technology in Mesa, AZ for their invaluable technical assistance in preparing this website for the Internet.